Easter has come and gone, but in the sale aisle of your favorite store it is still alive and well. All Candy Addicts know this magical time of year: the Easter candy sales! I of course was armed and ready for the big day. I mean really, how can you resist an activity that allows you the thrill of the easter egg hunt, the control of the Easter Bunny, and the sweet reward of the Easter basket all in one go? Get thee to the sale aisle! I went with a plan of action this year. Normally, I just scout for my favorites and get the stockpile ready in my secret candy bunker, but I decided to go with a different plan this year. I still felt the need for something new. I immediately zeroed in on the idea of jelly beans. Why? Well, when you think about it, how can you go wrong with jelly beans? So I decided to pick up a bag of any of the different types I could find. 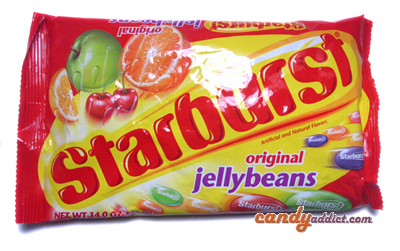 Here’s what I came home with: Starburst Jelly Beans, Starburst Red Fruits Jelly Beans, Starburst Tropical Jelly Beans, Jolly Rancher Jelly Beans, Jolly Rancher Smoothie Jelly Beans, Lifesaver Jelly Beans and last but not least, some of the Nerds Bumpy JellyBeans. I wanted to know what all my fellow writers were going crazy over. I was disappointed that I didn’t find any of the Teenee Beanee Jelly Beans or the Starburst Sour Jelly Beans, but I will find them another day. Green Apple: A good green apple flavor, with notes of red delicious and granny smith, and yet it has that standard “artificial” apple-ness to it. It didn’t impress me much; it was tasty, but it just didn’t stand out. Grape: Good, light grape flavor. I wouldn’t say it was powerful or terribly “juicy” but that’s nice since I’m not a big grape fan. Reminds me of the Smuckers grape jelly I have on PB&J sandwiches. Very juicy. Orange: Bright orange flavor that’s more sweet than zesty. It’s reminiscent of the Starburst flavor, but the flavor punch isn’t there. Regardless, it’s still a very nice, tasty bean. Strawberry: Texture wise, this one was the “grainiest” of the bunch. The flavor is similar to the Starburst, but the intensity isn’t there. It does have the great fruity flavor that really gets the saliva going in your mouth. Yum. Lemon: Tastes exactly like the lemon Starburst. First it’s tart, then it’s sweet with that citrus-y, floral lemon flavor. yum! Cherry: This one also tastes exactly like the cherry Starburst. Bright, fruity sweet with a little tang, and then some bitterness at the end from the food coloring, which I found odd, since I think this is the first time I actually noticed the bitterness. Oddly enough, I saved the lemon as the last ones to eat. Ha ha. 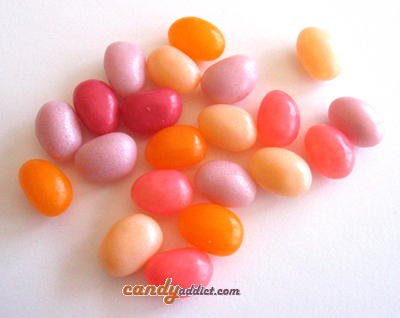 Strawberry (light pink): Tastes exactly like the strawberry bean in the normal mix, a little stronger in the intensity of flavor and therefore more faithful to the original candy. Watermelon (middle pink color): Whoo, most certainly the watermelon, and it tastes exactly like the watermelon Starburst: tart with bright notes of berries and melon, with that artificial “jolly rancher” flavor it it. 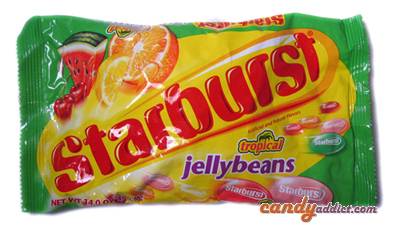 It even got the saliva goin’ like real Starburst. Lovely. Cherry: I was expecting it to be the same as the normal mix. It tastes different though, totally different. It doesn’t taste of cherry at all and it doesn’t remind me of the cherry Starburst. It has more “berry” notes to it, like raspberry and blackberry. The flavor seemed to change from bean to bean too; some were totally sweet, others had a burst of tartness in the middle that tastes of cherry, and still others had a burst of floral raspberry to them. Very odd, but tasty. Pineapple Orange (yellow): Very heavy on the pineapple, it’s awesome. It’s bright and fruity and zesty and very juicy. The orange is very faint and provides a subtle sweetness in the background. So good! Watermelon (green): Most certainly watermelon, but it’s so different from the red fruits version. It’s more “natural” if that makes any sense. You get a good melon/honey dew note, no extreme sweetness or tartness. The flavor is a little artificial, and the end flavor reminded me a little of apple. But overall, I’m surprised how different this tasted. Hawaiian Punch (dark red): So punchy, really, I get notes of pineapple, orange, lemon, cherry… and it has the tartness to it. Classic in terms of flavor. Strawberry Kiwi (medium pink): Hard to identify at first because it does have a subtle punchy-ness to it. It does have a tropical essence to it, which I think is how they are trying to depict the kiwi flavor. There is a sweet berriness to it, but it’s hard to identify as strawberry. Still, this was tasty. Mango Melon (orange): I definitely get the mango with its bright, pineapple/carrot-like notes. I get no melon though… only an odd floral-ness to the end of the flavor. Perhaps what they think melon tastes like? Strawberry Banana (light pink): A good mix of both flavors, a little strawberry, a little banana, and they go well. Nothing came off as strange and artificial. Worked well for me. Strawberry (red): Wow, this was… interesting. I haven’t tasted a strawberry flavor like this in a long time. It reads more as “mixed berry” in my mouth, with a blueberry/blackberry/strawberry flavor and a strong sweetness. Towards the end the strawberry flavor is singled out and takes a more sour turn. A different take on the flavor, but a nice one. Orange: Very bright orange flavor, both tart and sweet at the same time. The flavor reminds me of Tang, all the way. Grape: Tasted more “spicy” than it did of grape. The flavor was mild and sweet, and it only got a little tart towards the end. Blue Raspberry: Oooo, very much like the real thing, except a bit sweeter. A nice blue raspberry flavor in general with good fruity and floral raspberry notes with a kick of artificial flavors. Watermelon (pink): This tastes exactly like the hard candy. Tart, with that characteristic fake watermelon flavor. Apple: Very bright and apple-flavored. Not like the normal Jolly Rancher. This is much milder and sweeter in the beginning. Towards the end it gets sour and begins to resemble the hard candy more. Mixed Berry (lavender): Very odd… this is my best guess as to what the flavor is. There is a creaminess to it, and a fruitiness, but it’s off somehow and tastes a little rancid. It’s also terribly sweet, then gets tart towards the end. Kinda yucky. 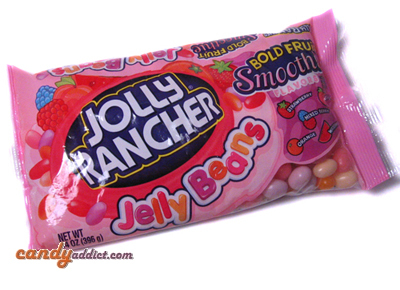 Strawberry (purple pink): Same flavor as the normal Jolly Rancher bean, but with a negligible amount of creaminess to it. Watermelon (medium pink): It has that artificial watermelon taste but is cut with a creaminess. It’s odd; watermelon and dairy is not something that goes together when I think about it, and this bean does little to change my mind. Peach (light pink): Very nice, fresh peach flavor. Reminds me of a sweet peach flavored yogurt. Orange (orange): nice and sweet, like an orange Creamsicle with an odd perfume-like aftertaste to it. Strawberry: I loved this one; it immediately reminded me of strawberry sherbet for some reason. It’s very sweet, creamy and fruity in that “strawberry ice cream” sort of way. Cherry: Tastes exactly like the cherry lifesaver, it even has that odd bitter tingle that lingers in your mouth afterward. Peach: Quite floral and fruity, in that order. It has a night light peachy flavor and tastes authentic to me. Orange: Very much like the orange lifesaver we all know and love. Yum! Intensely flavored with good sweet and zesty orange notes. Lemon: Sooo good. I love lemon flavors. This one statrs out nice and zesty with strong lemon notes, then mellows into sweetness. I’ll trade you my red ones for your yellow ones. Pineapple: The one I looked forward to most! It tastes so much like the actual lifesaver. bright tart notes of the pineapple shadowed by a slight sweetness. Very juicy and fruity. Grape: Such a typical grape flavor, like a very highly sweetened concord grape juice. I was surprised how authentic it tasted. My conclusions? Except for the Jolly Rancher Smoothie flavor, these were all pretty tasty and I’d easily buy them again next year. 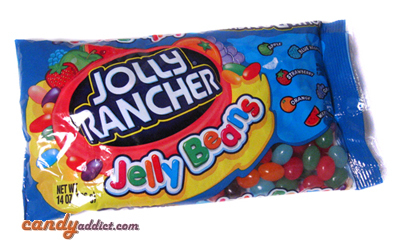 I was certainly surprised that I enjoyed them as much as I did, being raised on Jelly Belly Jelly Beans, which could easily result in jelly bean snobbery. Thankfully I was immune to this. So take my advice and go try some of these out for yourself if you haven’t already, as they’re a tasty addition to any easter candy bowl. I won’t tell anyone that the holiday is over, promise. 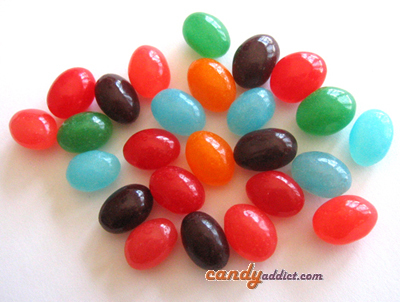 What about Sweettarts Jelly Beans? This was the first year I saw them. 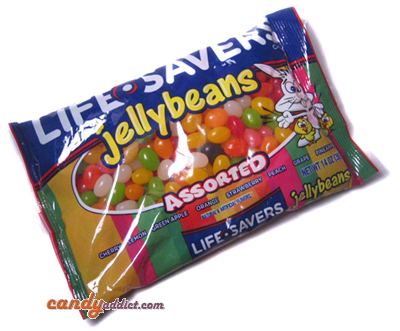 They don’t always taste like Sweettarts, but they don’t taste like most of these standard jellybeans either (which I am very tired of). Pretty unique, I put them up there near the Nerds jellybeans on my list. Now… mix em all up in a bowl and try to guess what each flavor is! Ha ha ha ha ha! You should all try to get your hands on some Hawaiian Punch jelly beans if you can. I found some just before Easter this year and WOW! They are best next to Jelly Bellys. I think they are seasonal though…couldn’t find them after Easter…so bummed. I was wondering if anyone has any clue how Strawberry Teenee Beanees taste? I want to buy them for my upcoming wedding but if they’re gross I’d rather not! How about Teenee Beanees Orange? You forgot the Starburst Sours, jelly beans, and a new one I found this year, Hawaiian Punch jelly beans. They are absolutely fantastic!!! !